Learn About Solar | Solar Batteries | What is the Best Battery for a Solar Panel System? There are certain specifications you should use when evaluating your solar battery options, such as how long the solar battery will last or how much power it can provide. Below, learn about all of the criteria that you should use to compare your home energy storage options, as well as the different types of solar batteries. As you consider your solar-plus-storage options, you’ll come across a lot of complicated product specifications. The most important ones to use during your evaluation are the battery’s capacity & power ratings, depth of discharge (DoD), round-trip efficiency, warranty, and manufacturer. Capacity is the total amount of electricity that a solar battery can store, measured in kilowatt-hours (kWh). Most home solar batteries are designed to be “stackable,” which means that you can include multiple batteries with your solar-plus-storage system to get extra capacity. While capacity tells you how big your battery is, it doesn’t tell you how much electricity a battery can provide at a given moment. To get the full picture, you also need to consider the battery’s power rating. In the context of solar batteries, a power rating is the amount of electricity that a battery can deliver at one time. It is measured in kilowatts (kW). A battery with a high capacity and a low power rating would deliver a low amount of electricity (enough to run a few crucial appliances) for a long time. A battery with low capacity and a high power rating could run your entire home, but only for a few hours. Most solar batteries need to retain some charge at all times due to their chemical composition. If you use 100 percent of a battery’s charge, its useful life will be significantly shortened. 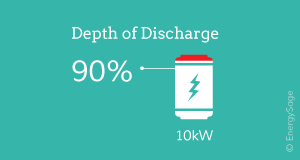 The depth of discharge (DoD) of a battery refers to the amount of a battery’s capacity that has been used. Most manufacturers will specify a maximum DoD for optimal performance. For example, if a 10 kWh battery has a DoD of 90 percent, you shouldn’t use more than 9 kWh of the battery before recharging it. Generally speaking, a higher DoD means you will be able to utilize more of your battery’s capacity. 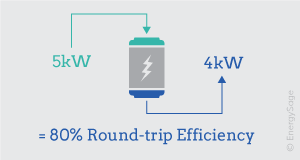 A battery’s round-trip efficiency represents the amount of energy that can be used as a percentage of the amount of energy that it took to store it. For example, if you feed five kWh of electricity into your battery and can only get four kWh of useful electricity back, the battery has 80 percent round-trip efficiency (4 kWh / 5 kWh = 80%). Generally speaking, a higher round-trip efficiency means you will get more economic value out of your battery. For most uses of home energy storage, your battery will “cycle” (charge and drain) daily. The battery’s ability to hold a charge will gradually decrease the more you use it. In this way, solar batteries are like the battery in your cell phone – you charge your phone each night to use it during the day, and as your phone gets older you’ll start to notice that the battery isn’t holding as much of a charge as it did when it was new. Your solar battery will have a warranty that guarantees a certain number of cycles and/or years of useful life. Because battery performance naturally degrades over time, most manufacturers will also guarantee that the battery keeps a certain amount of its capacity over the course of the warranty. Therefore, the simple answer to the question "how long will my solar battery last?" is that it depends on the brand of battery you buy and and how much capacity it will lose over time. For example, a battery might be warrantied for 5,000 cycles or 10 years at 70 percent of its original capacity. This means that at the end of the warranty, the battery will have lost no more than 30 percent of its original ability to store energy. Many different types of organizations are developing and manufacturing solar battery products, from automotive companies to tech startups. While a major automotive company entering the energy storage market likely has a longer history of product manufacturing, they may not offer the most revolutionary technology. By contrast, a tech startup might have a brand-new high-performing technology, but less of a track record to prove the battery’s long-term functionality. 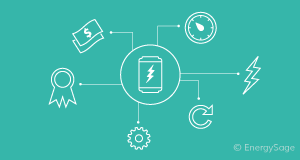 Whether you choose a battery manufactured by a cutting-edge startup or a manufacturer with a long history depends on your priorities. Evaluating the warranties associated with each product can give you additional guidance as you make your decision. Home energy storage technology and electric vehicles are a lot alike: they both use advanced batteries to create more efficient, sustainable products that can reduce greenhouse gas emissions. As electric vehicles become more popular, more companies are dedicating significant research and development funds to developing batteries, and they’re expanding into the energy storage business. Tesla is the first mainstream example (with their Powerwall battery), but Mercedes-Benz and BMW are also bringing standalone batteries to the market in 2017. There are two ways to answer this question and the first is to determine how long a solar battery can power your home. In many cases, a fully charged battery can run your home overnight when your solar panels are not producing energy. To make a more exact calculation, you'll need to know a few variables, including how much energy your household consumes in a given day, what the capacity and power rating is for your solar battery and whether or not you are connected to the electric grid. For the sake of a simple example, we'll determine the size of a battery needed to provide an adequate solar plus storage solution with national average data from the U.S. Energy Information Administration. The average U.S. household will use roughly 30 kilowatt-hours (kWh) of energy per day and a typical solar battery can deliver some 10 kWh of capacity. Thus a very simple answer would be, if you purchased three solar batteries, you could run your home for an entire day with nothing but battery support. In reality, the answer is more complicated than that. You will also be generating power with your solar panel system during the day which will offer strong power for some 6-7 hours of the day during peak sunlight hours. On the other end, most batteries cannot run at maximum capacity and generally peak at a 90% DoD (as explained above). As a result, your 10 kWh battery likely has a useful capacity of 9 kWh. Ultimately, if you are pairing your battery with a solar PV array, one or two batteries can provide sufficient power during nighttime when your panels are not producing. However, without a renewable energy solution, you may need 3 batteries or more to power your entire home for 24 hours. Additionally, if you are installing home energy storage in order to disconnect from the electric grid, you should install a few days' worth of backup power to account for days where you might have cloudy weather. The general range for a solar battery's useful lifespan is between 5 and 15 years. If you install a solar battery today, you will likely need to replace it at least once to match the 25 to 30 year lifespan of your PV system. However, just as the lifespan of solar panels has increased significantly in the past decade, it is expected that solar batteries will follow suit as the market for energy storage solutions grows. Proper maintenance can also have a significant effect on your solar battery's lifespan. Solar batteries are significantly impacted by temperature, so protecting your battery from freezing or sweltering temperatures can increase its useful life. When a PV battery drops below 30° F, it will require more voltage to reach maximum charge; when that same battery rises above the 90° F threshold, it will become overheated and require a reduction in charge. To solve this problem, many leading battery manufacturers, like Tesla, provide temperature moderation as a feature. However, if the battery that you buy does not, you will need to consider other solutions like earth-sheltered enclosures. Quality maintenance efforts can definitely impact how long your solar battery will last. What are the best batteries for solar? Batteries used in home energy storage typically are made with one of three chemical compositions: lead acid, lithium ion, and saltwater. In most cases, lithium ion batteries are the best option for a solar panel system, though other battery types can be more affordable. Lead acid batteries are a tested technology that has been used in off-grid energy systems for decades. While they have a relatively short life and lower DoD than other battery types, they are also one of the least expensive options currently on the market in the home energy storage sector. For homeowners who want to go off the grid and need to install lots of energy storage, lead acid can be a good option. The majority of new home energy storage technologies, such as the , use some form of lithium ion chemical composition. Lithium ion batteries are lighter and more compact than lead acid batteries. They also have a higher DoD and longer lifespan when compared to lead acid batteries. However, lithium ion batteries are more expensive than their lead acid counterparts. A newcomer in the home energy storage industry is the saltwater battery. Unlike other home energy storage options, saltwater batteries don’t contain heavy metals, relying instead on saltwater electrolytes. While batteries that use heavy metals, including lead acid and lithium ion batteries, need to be disposed of with special processes, a saltwater battery can be easily recycled. However, as a new technology, saltwater batteries are relatively untested, and the one company that makes solar batteries for home use (Aquion) filed for bankruptcy in 2017. EnergySage has reviewed all of the best solar batteries available for your home. Use our in-depth solar battery reviews. Can I go off the grid with solar panels?